Attending Rosamond Bernier‘s lecture “The Couture Parade” at The Metropolitan Museum of Art on Thursday, last, got me thinking. Here was a woman of a certain age, wearing and surrounded by, works of art. “One should either wear a work of art or be a work of art” said Wilde. Yes, she was a past European editor of Vogue, and yes, she did have the good fortune to be in Paris when the exchange rate was a little more in our favour and so could afford to dress well. But how did this wonderful, energetic and tasteful woman choose clothing that has stood the test of time to become true classics? 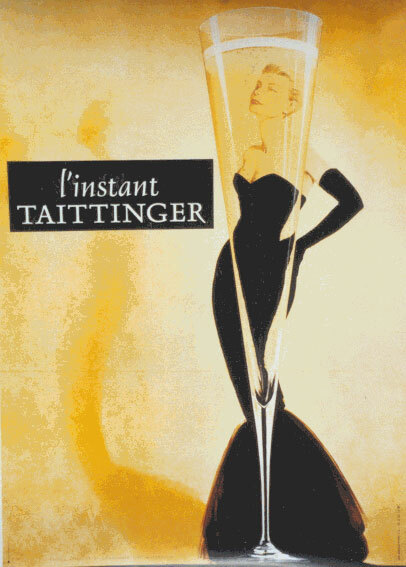 (For example, a black evening dress she wore was the inspiration behind the one in the “l’Instant Taittinger” advertising campaign of the 1980’s.) At what point did she know that a piece in which she was investing would be not only “worth the money” but also a timeless possession? Certainly the designers of the time, were, as all designers are, a bit avant-garde. When it comes to clothing, I am a classics major. Contemporary design seems to me to be disposable. Even if very well made. Is it strictly a matter of “you get what you pay for”? Or is there some other way of weighing the pros and cons and winding up with a wardrobe that looks as good today as it did 60 years ago? True elegance is timeless. How do you choose clothing that will make the cut year after year? And who are those role models in today’s society who set the standards for good taste? For men, I’m afraid, we are sadly lacking. Although Hamish Bowles, with his suits made on the Row, stands out as a true original, in my book. I didn’t get a chance to ask. But I think I will e-mail Mme. Bernier and let her know how much I enjoyed the evening and that we would love to know her secrets for choosing well and wisely.